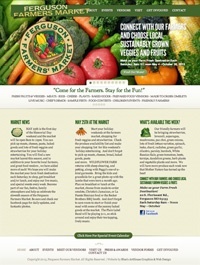 The Ferguson Farmers Market is an award winning year round farmers market in Ferguson, MO which offers a huge variety of fresh, locally produced vegetables, fruits, meats, cheeses, baked goods and prepared foods. We should know because Blue shops here every weekend! For this website, we selected an earth tone color palette and we change the photos in the front page slider seasonally.